Sam’s current focus is on designing meaningful learning experiences that are important in the development of students as human beings, not just students in the isolated world of schools and school “work”. Sam works with educators to help them see how learning can be based on real life and on students’ genuine interests, concerns and needs. He also works with educators to see how student-driven learning leads to rich and diverse connections within existing curriculum frameworks. Beyond planning, Sam works with educators on the pedagogy, teacher mentality and learning environments that create the conditions for powerful learning to happen. why are our students learning this? how can we hand responsibility over to our students earlier and earlier in the learning process? how do we use real people, places and experiences for learning? how do we use time and space to create the conditions for learning? how do we and our students document learning? Sam works at the International School of Paris. Chad’s current focus is on designing creative and thoughtful planning meetings that bring out the most powerful thinking and ideas. A well run meeting does not just happen by chance. Having a clear purpose gives clarity and generates positive energy and flow. Creating a relaxed environment invites others to have a voice to feel part of the process. Knowing your audience and how to bring people together takes time. The investment in designing a meeting before a meeting is paramount, yet often overlooked. Chad works with teachers in modelling how to run effective planning meetings that are fluid and engaging. This process guides teachers to lead and leverage learning through empowerment. How do we design a meeting that invigorates thinking and ideas? How can a unit not just build from ‘last year’s unit’ but, also from the previous unit? What strategies can be used so that teachers come to the meeting with ideas and things to share? How do we use time so that everyone in the room walks away feeling confident and clear about the direction of the teaching and learning? Why is it important to ensure that everyone has something to do by the end of the meeting? What is the most meaningful way to promote engagement and voice? How do you create the right mood for a meeting so people are relaxed and ready to contribute? How do you develop a culture where challenging ideas is safe and also expected? Chad is based in Laos and is available for consultancy in Asia and Australia. Frank Hua is the PYP Technology Integration Specialist at International School Ho Chi Minh City. 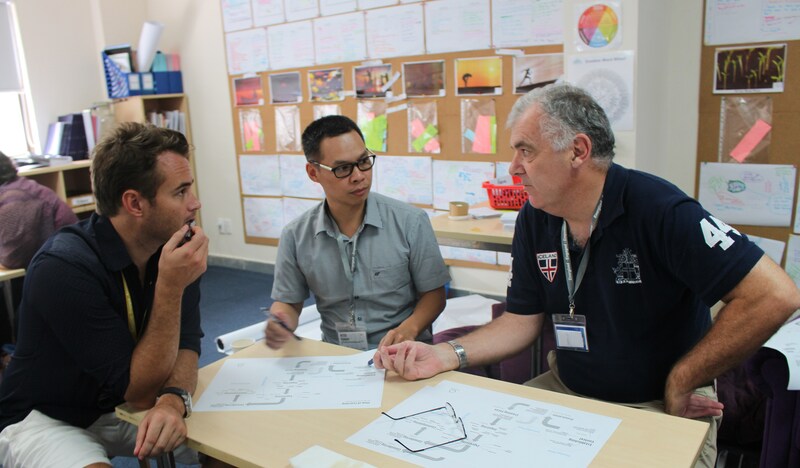 He designed and runs the MakerSpace at ISHCMC. Along with his school, he is part of an innovative movement taking place in international schools in Asia. He has a background in graphic design and video production. As a consultant, Frank can provide a fresh look into creating a space for making, creating and learning new skills. With his design background, he can help integrate the design cycle into your curriculum, units of inquiry and lesson plans. He brings a wealth of knowledge and can help adapt your space into something that creates a space for learning based on needs. What drives him is the ever changing world that surrounds him. No two days are ever the same in his world. One day he could be filming a green screen video and the next day helping students with baking cupcakes. He is able to adapt on his feet and switch gears to cater to his students needs. The ability to learn new skills, new concepts and new technology is what makes him so adaptable. Being a proficient problem solver also helps in making sure time spent with students is productive.